Keep family photos here. 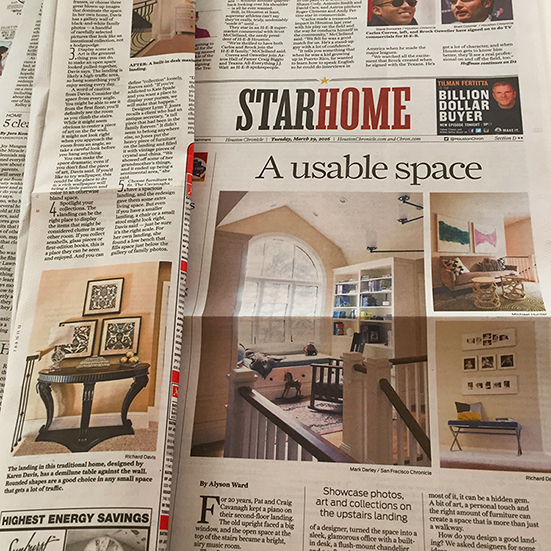 The landing is an ideal spot to display your family photos, says Karen Davis, owner of the interior design firm Marker Girl. When you hang photos up and down the staircase, you create wall clutter – and besides, no one ever really stops to look at photos on the stairs. Instead, put your family photos on the wall at the top of the stairs. Display some art. Art is the greatest thing you can do, to make an open space looked pulled-together, Davis says. The landing is likely a high-traffic area, so hang something you’ll enjoy seeing every day. A word of caution from Davis: Consider the space from every angle. You might be able to see it from the first floor; you’ll definitely see the room as you climb the stairs. 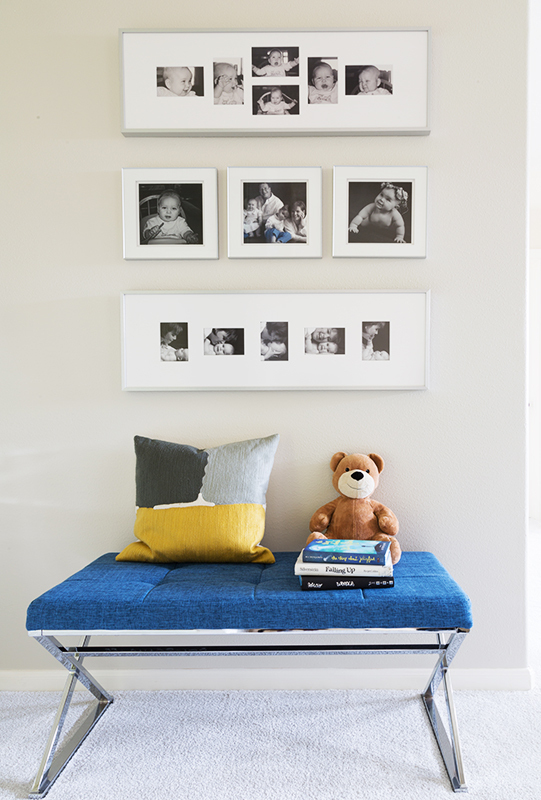 While it might seem obvious to center a piece of art on the far wall, it might not look right when you approach the room from an angle, so take a careful look before you hang anything. Go for curves, not corners. If you put in furniture with sharp edges, you increase the chances that you’ll bump into something and hurt yourself. “I generally recommend about 2 feet of clearance,” Davis said – enough space for a person to walk without having to skirt around the furniture. Davis likes to use a demilune table, which hugs the wall and extends in a smooth half-circle. If you install bookshelves or a cabinet with hard edges, try to keep the furniture out of the most heavily used pathways. “It’s really important to make sure you have enough walk space,” she said; the landing is, above all, still a walkway. When the chronicle called they asked for photos I told them I had one space I could give but my own landing was not quite finished. It honestly wasn’t my priority since I am working on the main rooms. 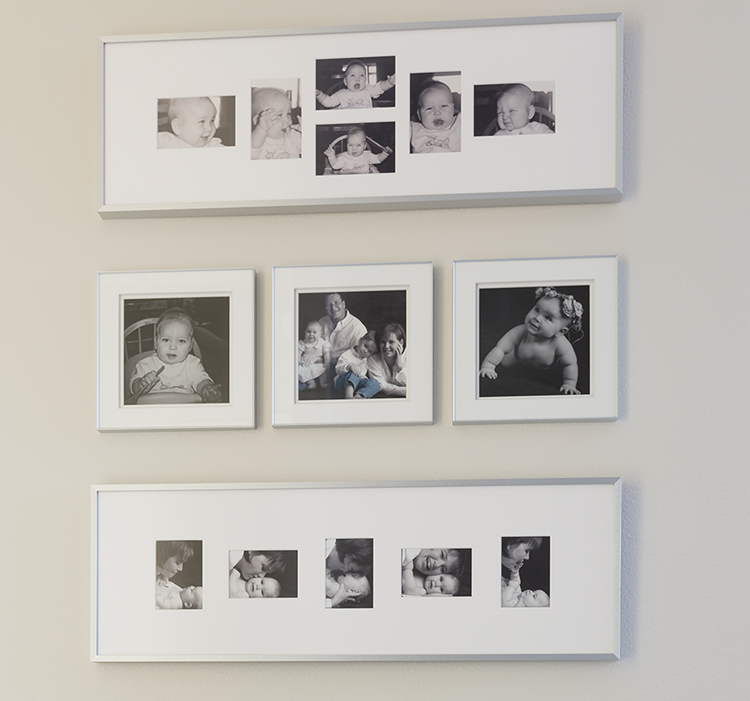 I had a small family gallery up black and white photos taken several years ago by a professional photographer when my daughter was 6 months old and son was 3. I love 6 months it is when they start to really show their personalities. The photographer capture a moment with my daughter, ones that I love. It is a small series that I have in one frame. My husband just so happen to have taken a series of photos when my son was six months being silly in the high chair at his Granny’s in England, so I had it framed in a series like my daughter’s. We had the family photo from the professional photographer as well in this mini gallery, she highlighted only the blue denim color in my son’s jeans. What to put under the photos was the challenge? There is not much space to walk around and a chair in the corner you couldn’t see. I went out to run some errands and happened to be near a Home Goods Store late that afternoon after I was interviewed, I decided to just see if there was something there. 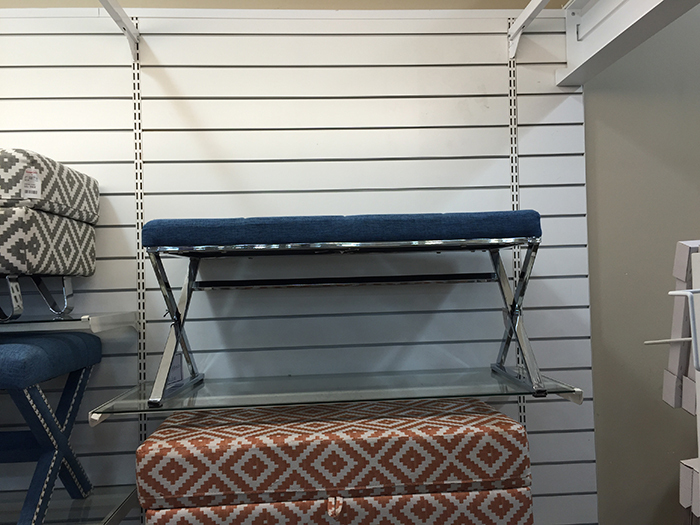 I looked at the wall of furniture and what do I see a bench with the same color denim blue as the fabric. It was perfect. Who knew my very late easter shopping would actually be a good thing! Voila my stair landing is complete! The bench size doesn’t block the walkway area and highlights the denim in the picture. It can function as extra seating when my kids have friends over to play video games in the game room (that I am currently redecorating). The landing leads right into the game room. They can just pull it in when they want to use it. I added a fun pillow to give it a little color. I got my mini stair landing design, one that is truly family-friendly and meaningful to me. It even got featured in the chronicle along with my other photo.